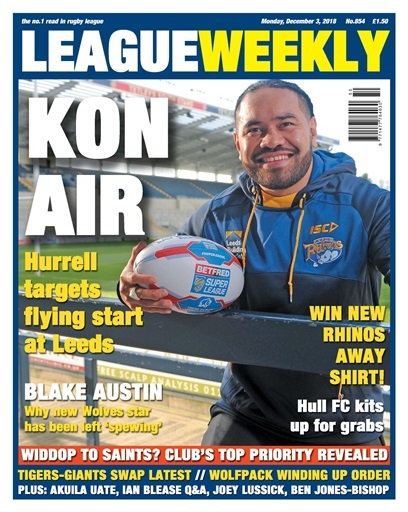 KON AIR is ready for take off ... we catch up with Konrad Hurrell after he flies in to begin life at Leeds Rhinos. There's also a chance to win a new Rhinos away shirt - and that's not the only kit giveaway this week! Hull fans can also win one of their new home or away jerseys. We speak to Blake Austin two weeks into pre-season with Warrington. The marquee star delivers a surprising verdict on how the talent in the UK compares to Australia – plus he reveals why he's been left 'spewing' by a development for 2019. 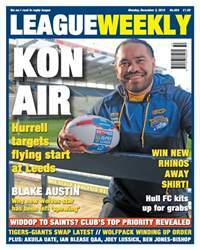 There's the latest on Saints' interest in Gareth Widdop, plus shock news of a winding up petition facing Toronto Wolfpack... find out why the Canadians are due in court. England get a boost in the world rankings, Wakefield Trinity join the Women's Super League and there's an update on the proposed swap between Castleford and Huddersfield.